The Family Program is offered a minimum of twice a month, typically Thursday through Sunday. Mid-week programs are occasionally offered; please check the schedule for dates. Check in is from 4 to 6pm on Thursday and the program concludes at 2pm on Sunday. *Note: All Family Events Require Pre-Registration. 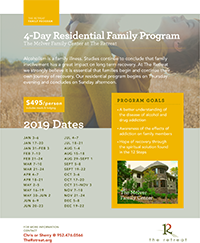 Please Contact Sherry at sgaugler-stewart@theretreat.org (952.476.0566) or Chris at cnehotte@theretreat.org or either of them at 952.476.0566. Thank You!